ULINK2 has only one set of jumpers: VCC. 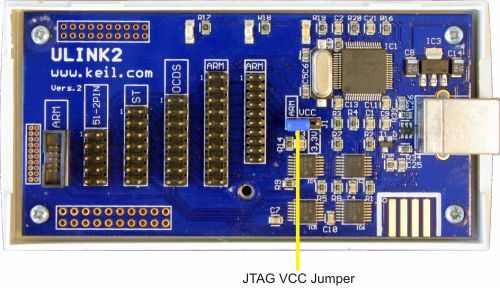 The VCC jumper determines the source of VCC power for the JTAG interface. If the target hardware provides VCC to the JTAG interface, set the jumper at VCC to the ARM position. If the target hardware does not provide VCC to the JTAG interface, set the jumper at VCC to the 3.3V position.